I know...some of you may find the above sight unnerving and maybe even unappetizing, but I'd like to assure you that that's not the case. 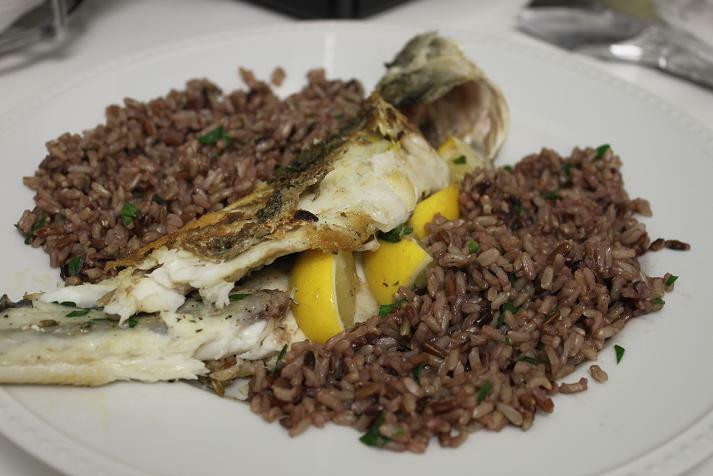 Experimenting with whole fish is quite the culinary adventure that produces rewarding results. I recently tried it with a whole branzino that happened to be on sale at Whole Foods' fish section. Even though the fish there veers on the expensive side and isn't always as good as your local fish place, it's still a reliable outlet to turn to for fresh and frozen fish. So there I was, at the fish counter...mesmerized by what just transpired. "Did I just order a whole fish?" I thought to myself? "With the head, eyes, mouth - the whole shebang?" But what was done was done - now I had to move on and think creatively about how I'd prepare this thing, while my nice fishmonger scaled, gutted and de-finned poor fishie. Sure I could've looked up an easy recipe to use, but what I really wanted to do was to cook free-form. So I did what any other comfortable cook would've done, I stuck to the basics. Getting some lemon and fresh parsley was the extent of my accouterments for the fish. Yep, that was it, 3 ingredients besides the salt, pepper and some oil of course. Preheat your grill or grillpan to medium-high heat. Butterfly the branzino (meaning cut it in half with the spine still attached). This creates more surface area for you to stuff your fish. Oil your fish by brushing it lightly with olive oil both on the inside and outside. The outside is especially important to make sure you get that crackly skin and so it doesn't stick to your grill/grillpan. Salt and pepper your fish (go lighter on the salt than the pepper) and then stuff the inside with fresh parsley and lemon wedges. Enclose the fish again so it looks as it did before you butterflied it. Place it on the hot grill/grillpan and cook for about 5 - 7 minutes on each side (depends on the size of your fish). You'll want to check on the fish periodically to make sure you're not overcooking it. When you see that the skin has a nice sear on it, flip it over and repeat the grilling process on the other side. Remove from grill and serve immediately with extra lemon wedges. I made a side of wild rice that I used as a bed for this dish. Serving it family style, I placed it on a large platter and Dan and I dug in and had a ball deconstructing fishie. I hope you get to try this at home and that you let me know how you liked it.